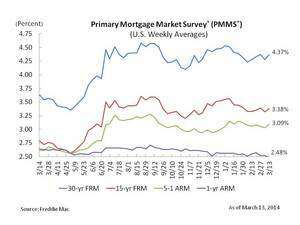 MCLEAN, VA--(Marketwired - Mar 13, 2014) - Freddie Mac (OTCQB: FMCC) today released the results of its Primary Mortgage Market Survey® (PMMS®), showing average fixed mortgage rates edging up following a week with little new economic and housing news. 30-year fixed-rate mortgage (FRM) averaged 4.37 percent with an average 0.6 point for the week ending March 13, 2014, up from last week when it averaged 4.28 percent. A year ago at this time, the 30-year FRM averaged 3.63 percent. 15-year FRM this week averaged 3.38 percent with an average 0.6 point, up from last week when it averaged 3.32 percent. A year ago at this time, the 15-year FRM averaged 2.79 percent. 5-year Treasury-indexed hybrid adjustable-rate mortgage (ARM) averaged 3.09 percent this week with an average 0.4 point, up from last week when it averaged 3.03 percent. A year ago, the 5-year ARM averaged 2.61 percent. 1-year Treasury-indexed ARM averaged 2.48 percent this week with an average 0.4 point, down from last week when it averaged 2.52 percent. At this time last year, the 1-year ARM averaged 2.64 percent. "Mortgage rates edged up amid a week of light economic reports. Of the few releases, the economy added 175,000 jobs in February, which was above the market consensus forecast and followed an upward revision of 25,000 jobs for the prior two months. Meanwhile, the unemployment rate nudged up to 6.7 percent, the first rate increase in over a year."